Definition - What does Utthita Parivrtta Anjaneyasana mean? 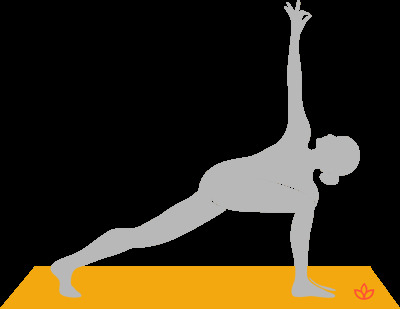 Utthita parivrtta anjaneyasana is an intermediate variation of anjaneyasana. From Sanskrit, utthita means “extended” and refers to the position of the arms in this posture; parivrtta means “revolved”; anjaneya means “praise”; and asana means “pose." In this asana, the right leg steps forward with the knee bent to a right angle, and the left leg extends straight back in a lunge position. The torso twists over the right leg and the left arm reaches down while the right arm reaches straight up. The drishti is up toward the right hand. After holding the posture, it is repeated on the opposite side. Utthita parivrtta anjaneyasana may be referred to in English as extended revolved crescent lunge. In addition to its physical benefits, utthita parivrtta anjaneyasana offers mental and energetic benefits. As it challenges the yogi’s balance, this can help develop focus and concentration, as well as proprioception. It is also considered very energetically uplifting, rejuvenating the body and mind, and building confidence. Traditionally, utthita parivrtta anjaneyasana, like many twisting postures, is associated with the manipura chakra. This chakra is thought to be the energetic center of action and purpose. Blockages in this chakra are associated with obsessions with power and over-competitiveness. Working with the manipura chakra is said to help yogis find their own strength and willpower. It can also help the yogi to build their self-esteem and confidence, giving them the power to overcome challenges.